Part K of SANS 10400, Walls in the National Building Regulations (NBR) covers the structural strength and stability of all walls, including those that form part of a house or other building, and both garden and boundary walls. They also deal with retaining walls which, by definition are intended to “resist the lateral displacement of materials”. If the wall is not designed the right way, it simply won’t resist the pressure of soil or other materials pushing against it, and it might collapse injuring or even killing people. It is for this reason that it is essential for all retaining walls to be designed by a competent person, preferably an engineer, and for plans to be drawn up and submitted to the relevant local authority for approval before building begins. Over the years we’ve had numerous queries from visitors to this site regarding retaining walls, many homeowners wanting to know whether plans are required. The only walls you may be build without plans are those that are considered, by the National Building Regulations to be minor building work. Specifically, Part A of SANS 10400, General Principles and Requirements says “any free-standing wall constructed of masonry, concrete, steel, aluminium or timber or any wire fence where such wall or fence does not exceed 1,8 m in height at any point above ground level and does not retain soil,” is regarded as minor building work. Even though plans are not required for minor building work, it is essential that minor building work complies with the NBR, and you should notify the local authority of your intention to build the wall. All retaining walls require plans that are approved, and they must be designed by a competent person or build it in accordance with the SABS “deemed to satisfy” rules that are laid out in Part K 4.2.4 Free-standing boundary, garden and retaining walls. 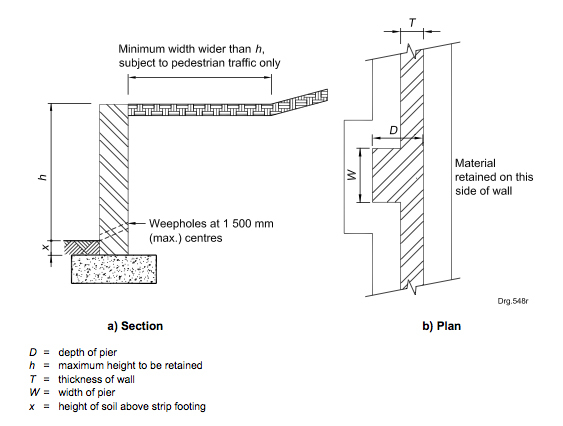 subsoil drainage is provided behind the wall by weepholes formed by building into the waIl, and 50 mm diameter plastic pipes, with the non-exposed end covered with geofabric, at a height that does not exceed 300 mm above the lower ground level, and at centres that do not exceed 1,5 m.
Note that the specifications for garden walls that do not retain earth are different. Incorrectly built retaining walls can be downright dangerous. 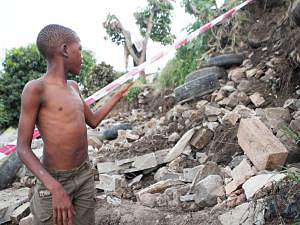 Just a couple of months ago an adult and six children were injured when a retaining walls collapsed on them in Quarry Heights, Durban. At the time, the children and several adults were helping Busisiwe Shabane backfill a retaining wall with sand and rubble to create an area that was level with her house. Two of the children were trapped under the wall. According to Shanbane’s husband, Caphius, they were trying to strengthen the wall which appeared to be about to collapse. He said they were afraid that if the wall collapsed, the house would then collapse. He said they had used tyres, but these had been dislodged by heavy rain. They had also built two retaining walls using hollow cement blocks. When these began to crack and show signs of falling, they broke one down and rebuilt it. The wall was apparently six blocks high, which would have made the wall about 1,2 m high. Clearly it was not built according to the NBR, and there were certainly no approved plans. Thankfully no-one was killed, but two weeks ago 18 people died and three were injured when a retaining wall collapsed on a shack in China’s Shandong Province. This collapse was also caused by heavy rain. Although to the layperson low retaining walls might appear to be simple structures, the risks of badly built walls are acknowledged by engineers. When an engineer designs a retaining wall he or she will evaluate the soil and any rocks that are behind or below where the wall is to be built. They will also determine the best material for backfilling the wall and design drainage so that rain does not cause collapse. Sorry Andre, if you are quoting on something you need to know the regulations. How can you provide a service if you don’t know what you are doing? After the recent floods in Durban, my small retaining wall between my yard and my neighbour which is less than 1m high (800mm) was damaged by the flash flood and collapsed. The assessor submitted a report that said I did not have an engineering certificate? I spoke to an ex-building inspector and he said that I don’t need one for a retaining wall less than 1m. All I want is for the wall to be put back exactly like what was there (i.e. like for like). Do I really need an engineering certificate for such a small wall? Hi Mark, As far as we are concerned we totally agree with your “ex-building inspector”. But just to cover yourself ask your local authority what their requirements are and then get a note from them and give that to the assessor. Since I am at a higher level than my neighbour there is a retaining wall between our erven. The neighbour has erected a garage, a proper building, using the retaining wall as one wall of his new garage. He raised the height of the wall in the process. On my side the height was approximately 1 m, and about two meters on his side. I think that one cannot build on a retaining wall. Is this true? Your neighbour should have had approved plans to build the garage. The council might allow a retaining wall to be incorporated, but an engineer would have had to be involved. Contact the council and ask them to investigate. Apart from anything else, in most municipalities (other than Cape Town) require neighbours’ consent for you to build on a boundary. I have bank approximately 1.8m in height within my property. My neighbour and I have decided to put up a boundary-wall collectively. The problem is my neighbour is prepared to pay 50% only for the wall up to my property height and wants me to pay fully for the reminder of the wall. I can’t visualise the area so can’t really judge. But it’s up to the two of you to decide what is fair. If it is a retaining wall you’ll need plans. We Would like to build a retaining wall of about 1m in height to level out the garden. Do we need to submit plans for this? The National Building Regulations has a list of minor building works that do not require plans. In terms of walls, it states: “any freestanding wall built with masonry, concrete, steel, aluminum, or timber or any wire fence that does not exceed 1,8 m in height at any point above ground level and does not retain soil” … so yes you do. However the local authority has the right to waive the need for plans if they consider them unnecessary. So you will need to contact them. The “boundary wall” of approximate height 2.1m (constructed with 200mm hollow block) in our complex has come down due to the recent storms. No plans were submitted by the developer. The insurance has rejected the claim on the basis that the boundary wall should have been constructed as a retaining wall (it is retain around 1.5m of road reserve soil) hence was not constructed to the NBR specifications. The complex is around 6.5 years old. Do we have a claim against the Developer and should he reconstruct the wall at his cost? If not, what other legal routes can we explore as owners, who purchased their units from managing agents without the knowledge of the developers construction methods actions? I think you probably do have a claim against the developer because all walls over 1,8 m must have approved plans. You could probably claim against the managing agents as well. Hi, my property has been halved and a developer needs to build a retaining wall about 2 meters in height along a boundary. They want to come 2 meters into my property as a chamfer on my property is needed to build the wall. If this happens, I lose trees that would assist screening their development from my house. In addition, my driveway would then run along the wall, on the back-filled chamfer area. Do I have to allow this? Can they not build the wall 2 meters into their property? No you certainly don’t have to allow it. I am currently building a house through a developer, and the ground level of the property is very sloped. I want to raise the ground level by about 500-600mm and my developer is refusing to do anything as engineers plans to build a retaining wall with in my boundary wall need to be done up. was is the maximum height of retaining wall that can be build with out an engineers plans? in all honesty from everything i have read you are able to build a wall up to 1m high with no piers as long as it is collar jointed 290mm thick and has 50mm weep holes. is it really necessary to get a engineers plans to build a 6-7 course triple leaf wall practically against my boundary wall? This is what confuses me, i have contacted to retaining wall companies and they say that no engineered plans are required for walls under 1,2m or less than 65degree, they say it can be build from hollow blocks with a gravel foundation. why are there so many variations in the law? 1) Ask for a reference that gives this specification in the regulations/standards. If you are referring to specialised retaining blocks (e.g. Terraforce or Loffelstein), these companies have their own engineer’s recommendations and certainly these two companies have there own approved systems. This would make sense in terms of the 1,2 m or 65 deg spec they have quoted to you. Also they can be built on gravel. 2) Since the ultimate decision of whether plans must be submitted lies with the local authority, contact them to see if this specification is in line with their needs. SANS 10400-A mentions retaining walls in the context of minor building work (which is the only building work that does NOT require plans): “any free-standing wall constructed of masonry, concrete, steel, aluminium or timber or any wire fence where such wall or fence does not exceed 1,8 m in height at any point above ground level and does not retain soil. This clearly indicates that any wall that retains soil is NOT regarded as minor building work and therefore requires plans. However the Council does have the authority to waive the need for plans, which is why I suggest you contact them. 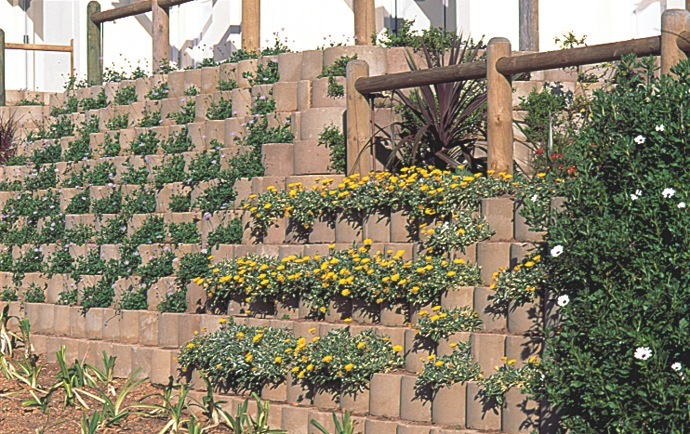 SANS 10400-K (2011), Walls has comprehensive guidelines for retaining walls. “Gravel foundations” are not mentioned in this Standard! However there is no detail on foundations required, and very little information in the Standard that specifically covers foundations. Nevertheless building any wall from “hollow blocks” requires a solid concrete foundation and the only drawing of a retaining wall in Part K indicates exactly this – a concrete “strip footing”. 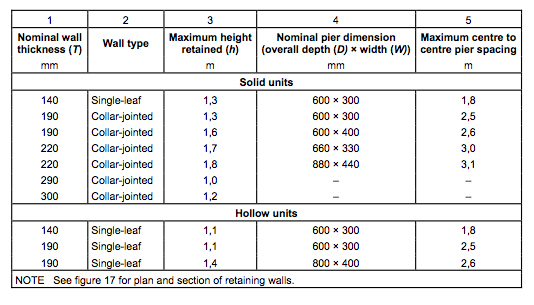 There is also a table that gives specs for retaining walls built from “hollow units”. The angle of the wall is not specified! It gives nominal wall thickness of 140 mm – 190 mm – 190 mm; all are single-leaf walls. Maximum heights 1,1 m – 1,1 m – 1,4 m. Nominal pier dimensions (overall depth x width) should be 600 x 300 mm – 600 x 300 mm – 800 x 400 mm and the maximum centre to centre for spacing of the piers should be 1,8 m – 2,5 m – 2,6 m.
NB The standard does not cover specialist retaining wall systems. There may be another SANS that does, but it is not part of the NBR (SANS 10400). Thank you for your advise Penny, i will look into it through council and NHBRC to make sure i the right advice on how to go forward. I would also like some other advise as i have combed through hundreds of pages and articles concerning the chasing of walls and screeds for electrical conduits and its just plastered over with no mesh wire to hold the plaster all together. with time this forms hair line cracks that never go away. Is there any Building regulation or NHBRC law holding the builder/developer responsible to have this done to prevent these hairline cracks that form along plumbing and electrical conduits? NHBRC does not have laws! 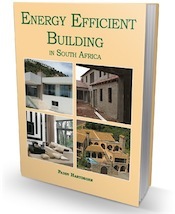 Their manuals provide guidelines for good building practise. I doubt there is anything that has guidelines to prevent hairline cracks, because these aren’t structural cracks. There is nothing related to this in the building regs. We have just had a retaining wall built by a qualified engineer. They put a drainage system into the wall to allow ground water to drain through. My neighbor is saying that the pipes which allow this water to drain are illegal. Is this true? If the water drains onto your neighbour’s property then it is a contravention of the NBR – and a very common one. I have written a lot about this on this site.